In my last column I talked about how not to write a message song. Now, let’s look at what works. It’s true that some people respond to the sledge-hammer, preachy You’ve got to…. You’d better…. Don’t ever school of message song, but I like to think more of us would rather be led gently than driven to enlightenment with a whip. I like songs to involve me in a scene I recognize I’m a part of, or one I feel is cut so realistically from the fabric of life that I could be a part of it. Parables are the best example of that kind of approach. Jesus, Buddha and all the great religious leaders used this type of approach. They were trying to get a message to masses of people and they knew they had to relate those messages to peoples’ real lives. The Good Samaritan was one of Jesus’ best. Wouldn’t you feel great if you wrote a song that 2,000 years later still taught the same message as strongly as it did when it was written? In contemporary music, one of the best examples of this type of message song comes from Harry Chapin. The message is that we should all try to spend more time with our parents and children. This message is very important in this time when all of us have so many activities that keep us away from each other. Chapin could have written a song that said, “You’d better hand out with your families or your family will die.” Sledge-hammer! No poetry, too general, impersonal and pompous. Instead he wrote Cat’s Cradle. The song starts out talking about the little boy, who, like most of us, wants to grow up to be like his dad. He wants some attention, which his dad is too busy making a living to give him. By the time the kid’s in high school and Dad has a little time, the kid has his own social life going and just wants to borrow the car. He gets married and has a son of his own and the old man, who finally longs for some companion-ship, finds that his son has, indeed, grown up to be just like him and doesn’t have time to see his dad. Chapin doesn’t give us any “You should” here. He doesn’t have to. He held a mirror to my life that made me call my father. He did it with real-life dialog and situations we’ve all been in. He also did it from a first-person point-of-view. The point-of-view is very im-portant in message songs. I think it’s effective to describe a situation in terms of your own personal involvement. If you’re offering a message, you’re really being a kind of salesman. Testimonials are al-ways very effective sales devices. A good approach is to let people in on your own discovery. What got you so excited that you wanted to tell us about it. The idea is that perhaps your enthusiasm will motivate us without your having to preach to us. Another effective thing about the first person (I, we) approach is that, assuming that put the song together in a way that makes people want to sing along with you, you’ll have them internalizing the message by saying “I” or “we” with you. Another effective point-of-view is that of the seemingly uninvolved storyteller who doesn’t moralize because, if the story is told well, there’s no need for it. One of the most powerful I’ve heard is Dylan’s Ballad of Hollis Brown, about a man who kills his family and himself rather than see them starve to death because he can’t find a job. Dylan wrote many other powerful songs in this way. Stevie Wonder’s Living For The City is another good ex-ample. 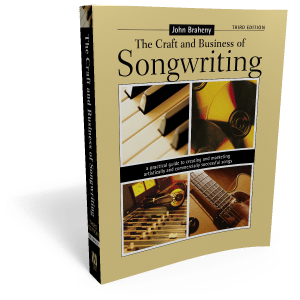 I don’t mean to imply that there are only a few approaches to writing effective message songs. What I’m focusing on here is ways to write for mass audiences who don’t necessarily share your point-of-view. You can use a “sledge-hammer” approach as a rallying song for people who are already on your side. You can use humor, satire, anything that works. And don’t forget that the music is also very important in helping people to hear the message, and remember it.